The Bus Rapid Transit (BRT) project was recognized for its contribution to rennovate Rio’s transportation system with the UITP Award 2015 in the Public Transportation Strategy category, given on 10/06 in Milan, Italy. The most important entity when it comes to promoting urban mobility, the International Public Transportation Union (UITP) recognizes innovative projects aligned with its strategy to foment sustainable transportation. BRT Rio was the only Latin American project among the 25 finalists in six categories. The UITP Awards received over 200 projects from all over the globe. “Receiving this award demonstrates how BRT has transformed the lives of cariocas. We are proud and we will keep advancing in urban mobility to improve quality of life for the population, integrating the city’s regions. 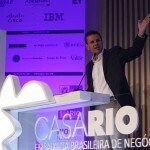 We want an even more united Rio”, stated mayor Eduardo Paes. BRT Rio already has two corridors in operation – Transcarioca and Transoeste – connecting the West Zone to Tom jobim International Airport. An additional two expressways are under construction: Transolímpica, which will connect Barra da Tijuca to Deodoro, going through the Olympic Park – main competition venue during the 2016 Rio Olympic Games; and TransBrasil, which will go from Deodoro to the City Center. In six years, it will be 155 km of corridors built. Together, the four corridors will have an estimated capablity to transport 1,4 passengers per day.